Fancy giving that music lover in your life a night out at Band on the Wall but can’t decide what gig to choose? The struggle is real – we hear you. 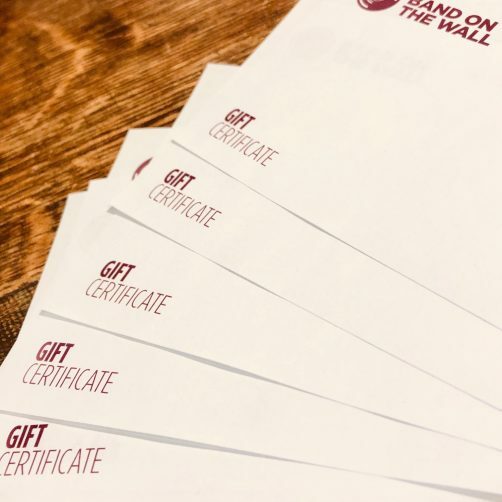 Our gift certificates are redeemable against tickets for any Band on the Wall show – at our venue or for Band on the Wall-promoted shows around the country. Available in denominations of £10, so there’s something for everyone! Redeemable against tickets only. Not available to redeem against merchandise, food, drink or other items. Redeemable at the Band on the Wall box office only – during opening ours in advance of concerts or on the door. Gift certificates cannot be used for online or telephone sales. As with cash/card sales, tickets are available subject to venue capacity. Gift certificates are shipped via first class post and are not downloadable. Please allow suitable time for postage when purchasing. If you would like to purchase higher value vouchers, please drop us an email.